Today was Maria’s 8th birthday party and we had a complete blast. 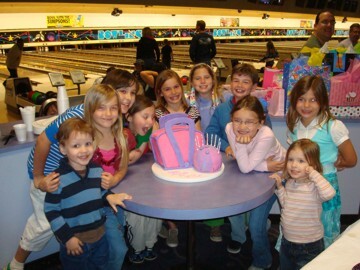 We normally have birthday parties at home, but since last year’s birthday was a bit…horrible…we relented and had her party at the local bowling alley. We wanted to make this one memorable as she’s nearly totally recovered from her shattered elbow. Praise God! We ended up with ten bowlers from the kids in her class and a whole bunch of family. 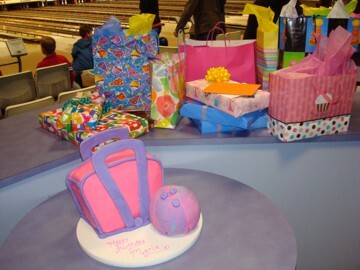 I made the cake of course and we had a vanilla cake bowling bag and a chocolate cake bowling ball, both covered in colored fondant. The kids also had pizza and soda and I think a great time was had by all. This past week, I actually went road-tripping with my Mom and I had an absolute blast. We went to Eastern Oregon to visit my grandmother so I could fix her computer and we could catch up a bit. It took a few days to get the computer square with the world, simply because they live in the middle of nowhere (dial-up and no wifi spots available…arg) and downloading updates for a few of her programs was a several hour process. After installing a significant memory upgrade, updating her programs, and making a few accessibility adjustments, it was good to go. While we waited for things to download, we had a fantastic time, just being with my Grandma. My Grandpa Bill passed away in December of 2006, and every time we’ve been there since, I’ve had kids in tow and there have been a myriad of other things I had to focus on. This time, we actually got to VISIT. Grandma took us all over town, showing us off to her friends and was infinitely proud that her granddaughter was fixing her computer. We went to several luncheons and potlucks and out to coffee with her friends everymorning. I made two lemon merengue pies (they were always my Grandpa’s favorite) and even made her some Easter eggs since I knew we would be headed home the day before. It was awesome talking with my Grandma about all sorts of stuff that I never knew, simply because there wasn’t time before and we were always interupted. I also spent a fair amount of time scanning family photographs although I didn’t make much of a dent since Grandma is a photographer and former newspaper editor and there are boxes of photos in every nook and cranny. Mom and I stayed up late every night just talking about life, family, work, her teaching, affiliate programming, my new business, just about everything under the sun. It was really a great trip and I can’t wait to do it again!! Thirty one years ago today, I was baptized. I was all of 14 days old, so I don’t remember it, but I know it was March 17th because of my Aunt Marge. Aunt Marge was perpetually old…she seemed ancient to my girlish eyes when I was little and was always a constant in my life. Every year, without exception, she sent me a card on my baptismal birthday. It was every bit as important as my regular birthday to her and I came to find its importance as well as comfort and wisdom in her brusque manners. As the world spun faster and faster, she shared small bits of advice in her slow manner with me while I was growing up. I distinctly remember sitting at my parent’s dining room table with a tiny notebook she always carried while she taught me how to spell so many of the words my dyslexia caused me to stumble over. We sat there for hours as she dictated words to me and I must have wrote the word “cinnamon” fifty times, but I did it. She was extremely proper, and I don’t know how many thousands of times she told me not to slouch and how to do things ‘just so’, but despite her demeanor she meant well and did it with love. I never really knew too much about the person that was Margaret Plancich and this I will forever regret. I do know that she worked for many, many years for Kelly-Clarke and she had many important business people as friends, although she never mentioned them. She never married although a cousin told me she once had a sweetheart who was killed and so she never married. Romantic…yes. Truthful? I have no idea. Regardless, it simply added to her mystique. Three years ago, my baptismal birthday cards stopped. My Aunt Marge had passed away the previous Decemember at 96. As the day got closer, I grew sad knowing that nothing important would be in the mail. When St. Patrick’s Day finally arrived, I was surprised by a card from my parents…and I sat on the front steps of our house and cried. I just came across a really wonderful article about Seniors helping overseas military families by clipping coupons. What a phenominal idea! I’ve known for a few years that military families were able to use expired coupons overseas, but never knew there was an organized effort. Also, I was never really certain where to send them. Here’s the low down: military families overseas can use expired coupons at their base PX and Commissary for up to SIX MONTHS past the expiration date. This helps the families of our brave servicemen and women make ends meet. There’s even a non-profit organization called the Overseas Coupon Program that encourages you to “adopt” a military base to send your expired coupons. If you figure that the average Sunday newspaper contains $125 worth of coupons, even if you take out $25 for your own family use, that adds up to $5,200 of unused coupons every year! That’s just from the Sunday paper too, not the rest of the week or the ones that come in the mail. Clip the coupons – send only manufacturer coupons that are expired by 2 months or less and clipping them will save on postage. Sort the coupons – sort into two piles; one for food coupons that can be used at the commissary and one for everything else for the PX. Food coupons should only be for “people” food. Pet food coupons belong in the PX pile. Place each pile in Ziploc baggies as other bundling methods aren’t reliable. Total the coupons – if you want to participate in OCP’s tallys, add up the value of your coupons and email the amount to OCP. This helps them determine which bases may need additional assistance and they keep a running total of the coupon value people have contributed. Mail the coupons – follow the simple directions available on the OCP website for mailing the coupons to a base in need. Be sure to follow all the directions to ensure they get received at the base you select. That’s it! Pretty simple! While our family no longer receives the paper, we do have family members that do and we also get coupons every week in the insert in the regular mail. I’ve always hated tossing good coupons for products we don’t personally need or use, but now I know where to send them! About six months ago Joel won a Xbox from Microsoft at eComXpo. We’ve got it set up and the kids enjoy playing the little arcade games and the demos. We have Viva Pinata, but it’s a bit beyond them still. About a week ago, Alex discovered that he really liked the LEGO Star Wars II demo on the xBox. No, I take that back, he doesn’t like it…he LOVES it. And he’s amazingly good at it. Joel and I have played it several times, but Alex has found secret areas we didn’t even know existed. So, today I was out and about and saw the Lego Star Wars: The Complete Saga in Target. I couldn’t resist and bought it. We had such a fabulous time this afternoon playing multiplayer on it…the whole family got involved and we just had a blast. Alex also played by himself for a bit and did great…not bad for a four year old that can’t even read all the directions! I’m so excited to see this movie! Not because the topic enchants me or because I like pseudo-documentarys at all, but because my little sister is an extra! She’s been sending us text messages all day about how close she is standing to Sean Penn. Who’d have thought my sis would be in movies?! Go Karey! I haven’t always enjoyed drinking root beer. When I was a kid, the only way I liked it was at the A&W as a root beet float and even then I just had a Coke ice cream float half the time. It wasn’t until college that I truly discovered how much I liked root beer…real root beer. Not that sticky sweet canned stuff. The deliciously creamy brewed root beer. My first taste of good root beer was Thomas Kemper’s craftbrewed root beer. I was in heaven…a smooth taste with just the right amount of bite. It’s made in small batches, so it’s always good. It was a tad spendy, so it wasn’t in my student budget too often, but I enjoyed it when I could. Also when I was at college, I got my first taste of fresh, on-tap root beer, courtesy of a lunch with a few co-workers and our physics professor, Bill Mackie. It was phenomenal. Period. If you every have the chance to visit the Golden Valley Brew Pub in McMinnville, Oregon you absolutely must try their root beer. It’s sweet and bitter and just fantastic. If I could get it down here in California, I would! So once I graduated and moved back here, I could no longer find Thomas Kemper at the store and tried several other “bottled” brands until I found Henry Weinhard’s root beer. Also delicious and smooth, it tastes great although I’ve found it seems to foam up more than the Thomas Kemper does. It too is a bit spendy and both brands are available now in my area at about $6 for a case of six. If you haven’t tried a real root beer, I would definitely recommend you run out and try some!